This chicken ragout is one of my comfort foods that I cook when I want to feel like home back in Germany. It's called fricassee in Germany and it's a dish that I have never had at restaurants. To me, fricassee has to be home-made, no matter what. 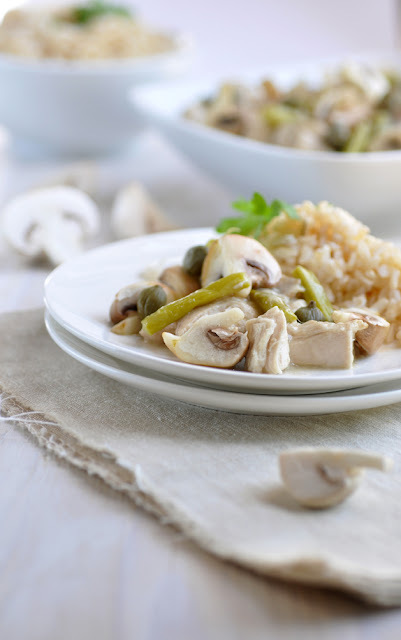 I love the straightforward taste of chicken rounded with asparagus and mushrooms and spiced with capers. It's still a light dish, as all its ingredients are light and the gravy contains just a little butter and flour. It takes some time to cook the chicken, but after that it's pretty quick and can be made well in advance. It's served with rice or boiled potatoes. Wash the chicken under running water and put it in a big heavy-bottomed pot. Cut celery roots, carrot and leek into big chunks and add to the pot. Add the parsley. Fill up with about 2 liters of water. Season generously with salt. Bring to the boil. Once it boils, turn down the heat and let simmer for about one hour. Take the chicken out. Drain the broth and keep it. Discard the vegetables. Let the chicken cool. Once it's cooled down, tear of all big chunky meat from the bones. Cut the chicken meat into bite sizes and set aside. In another heavy-bottomed pot, let the butter melt. Once it's melted whisk in the flour. Slowly add the chicken broth bit by bit, altogether about 300ml or up to 500ml of you like it with lots of sauce. Keep on whisking. Once the sauce thickens, add the mushrooms and the raw asparagus. Cook them in the sauce until crisp to tender (if you use canned asparagus, add it at the very last, as the canned ones are usually quite soft and dissolve quickly). Add the chicken chunks and the capers and cook for another 5-7 minutes. Transfer to serving dish. Serve with rice or boiled potatoes.